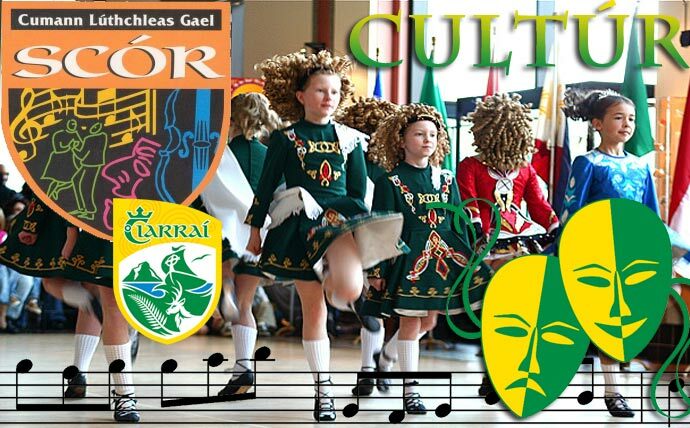 National glory for the Kingdom and Spa Set Dancers at the Knockrea Arena, Sligo I.T. which was a hive of activity on Saturday last February 17th for the All Ireland Finals of Scór na nÓg where over 1500 in attendance savoured and enjoyed the unique atmosphere created by All Ireland Scór and were in turn treated to a wonderful evenings entertainment from Clubs representing the four Provinces in the various categories and as each performance got underway they got a great reception. From Kerry's prospective it was a very special occasion being represented in three of the eight disciplines on the day and when the Adjudicators made their final deliberations we had one winner in the Spa Set Dancers; Erin Holland, Meghann Cronin, Siona Moynihan, Orlaith, Spillane, Liam Spillane, Gary O Sullivan, Cian O Sullivan, Eoghan Mulvaney. The dancers, who claimed back-to-back National Titles, were the final discpline of the evening. They came forward to collect their All Ireland Medals which was presented by Uachtartán Cumann Lúthchleas Gael, Aogán Ó Fearghail and Cathaoirleach Coiste Naisiúnta Scór, Antóin Mac Gabhann. There was great scenes of joy amid participants and supporters. from Na Gaeil, Tralee/St. Brendans Board in the Léiriú; Barry Sugrue, Dearbhala Quirke, Joshua, Roche, Liam Og Kingston, Emily Crowe, Isobel Crowe, Aine O Sullivan, Aoife O Sullivan. and Dr. Crokes, East Kerry Board Mark Cooper, Treasa O Sullivan, Cillian Hickey and Jamie Muldoon in the Quiz. Each and everyone, even in defeat, played a big part in the outstanding success of Coiste Scór Chiarraí and were most unlucky not to get centre stage. The “Estuary, Print and Trophies, Ballylongford” Sponsored County Finals of Scór Sinsear will be held in the Mhuire Gan Smal, Presentation Primary School Castleisland on this Saturday February 24th commencing at 6pm where the District Boards from around the County will be striving to put their respective Clubs through to the next phase of the competition. Clubs from all 8 District Boards; (Tralee/St.Brendans/Castleisland; West Kerry, Mid Kerry, South Kerry, Kenmare District, North Kerry Football, North Kerry Hurling, East Kerry) are expected to be represented on the evening. All the winners of each category will then go forward to the Munster Semi Finals to be held in Cappamore, County Limerick on Saturday March 3rd where a place in the Munster Finals await the qualifiers here a week later at the same venue. The main event of the evening will be preceeded by the Question Time with a starting time of 4pm sharp. All clubs involved in the Question Time are reminded that you must be seated well in advance of the 4pm starting time. The outright winners in this discpline will represent the County and will go directly through to the All Ireland Finals where all 32 Counties will meet up at the Pegasus Ballroom, Clayton Hotel, Sligo on Saturday April 14th at 11am where the 2018 Quiz Champions will be made known.